of an LTI model satisfying H = H'. In this factorization, S is a symmetric matrix and G is a square, stable, and minimum-phase system with unit (identity) feedthrough. G' is the conjugate of G, which has transfer function G(–s)T in continuous time, and G(1/z)T in discrete time. without explicitly forming H = F'*R*F. As in the previous syntax, S is a symmetric matrix and G is a square, stable, and minimum-phase system with unit feedthrough. G0 has a mix of stable and unstable dynamics. H is a self-conjugate system whose dynamics consist of the poles and zeros of G0 and their reflections across the imaginary axis. Use spectral factorization to separate the stable poles and zeros into G and the unstable poles and zeros into G'. Confirm that G is stable and minimum phase, by checking that all its poles and zeros fall in the left half-plane (Re(s) < 0). G also has unit feedthrough. Because H is SISO, S is a scalar. If H were MIMO, the dimensions of S would match the I/O dimensions of H.
Confirm that G and S satisfy H = G'*S*G by comparing the original system to the difference between the original and factored systems. sigmaplot throws a warning because the difference is very small. Warning: The frequency response has poor relative accuracy. This may be because the response is nearly zero or infinite at all frequencies, or because the state-space realization is ill conditioned. 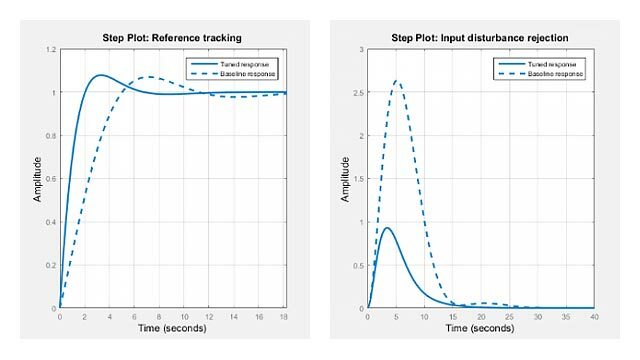 Use the "prescale" command to investigate further. Suppose that you have the following 2-output, 2-input state-space model, F.
Suppose further that you have a symmetric 2-by-2 matrix, R.
Compute the spectral factorization of the system given by H = F'*R*F, without explicitly computing H.
G is a minimum-phase system with identity feedthrough. Because F is has two inputs and two outputs, both R and S are 2-by-2 matrices. Confirm that G'*S*G = F'*R*F by comparing the original factorization to the difference between the two factorizations. The singular values of the difference are far below those of the original system. Consider the following discrete-time system. F has poles and zeros outside the unit circle. 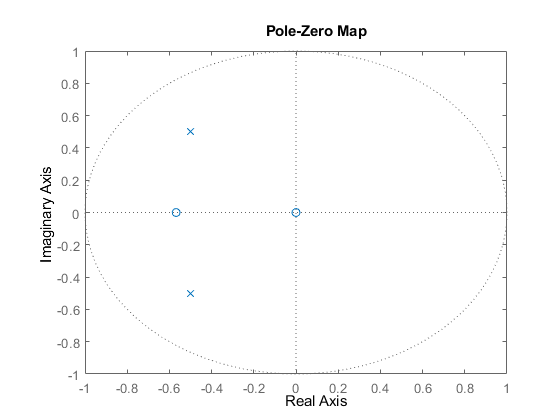 Use spectralfact to compute a system G with stable poles and zeros, such that G'*G = F'*F.
Unlike F, G has no poles or zeroes outside the unit circle. G does have an additional zero at z = 0, which is a reflection of the unstable zero at z = Inf in F.
Confirm that G'*G = F'*F by comparing the original factorization to the difference between the two factorizations. The singular values of the difference are far below those of the original factorization. Self-conjugate LTI model, specified as a tf, ss, or zpk model. Self-conjugate means that is equal to its conjugate, H = H'. The conjugate H' is the transfer function H(–s)T in continuous time and H(1/z)T in discrete time. In continuous time, H must be biproper with no poles or zeros at infinity or on the imaginary axis. In discrete time, H must have no poles or zeros on the unit circle. F factor of the factored form H = F'*R*F, specified as a tf, ss, or zpk model. F cannot have more inputs than outputs. R factor of the factored form H = F'*R*F, specified as a symmetric square matrix with as many rows as there are outputs in F.
H = G'*S*G, if you use the syntax [G,S] = spectralfact(H). G'*S*G = F'*R*F, if you use the syntax [G,S] = spectralfact(F,R). G'*G = F'*F, if you use the syntax G = spectralfact(F,). H = G'*S*G, if you use the syntax [G,S] = spectralfact(H). The dimensions of S match the I/O dimensions of H and G.
G'*S*G = F'*R*F, if you use the syntax [G,S] = spectralfact(F,R). 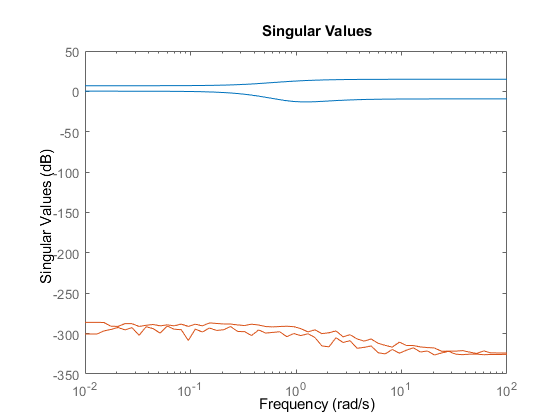 The size of S along each dimension matches the number of outputs of F.
spectralfact assumes that H is self-conjugate. In some cases when H is not self-conjugate, spectralfact returns G and S that do not satisfy H = G'*S*G. Therefore, verify that your input model is in fact self-conjugate before using spectralfact. 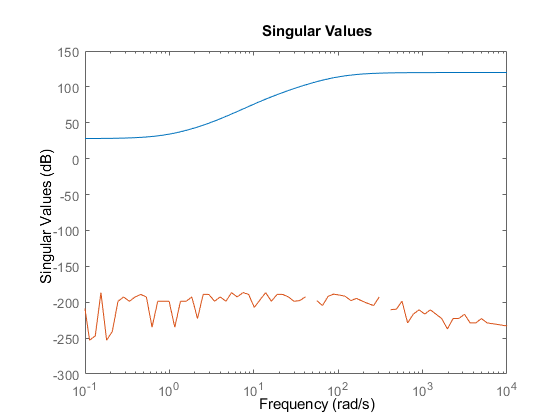 One way to verify H is to compare H to H - H' on a singular value plot. If H is self-conjugate, the H - H' line on the plot lies far below the H line.